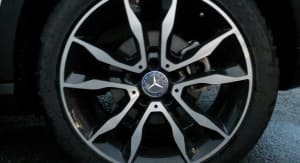 After getting to spend time in sports cars, hatchbacks, mid-size sedans, large cars, and a variety of SUVs, I was excited to see a Mercedes-Benz – my first ever – eagerly awaiting my arrival at the CarAdvice Melbourne office. 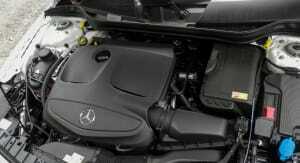 The car in question is the German brand’s first-ever small SUV, the Mercedes-Benz GLA-Class. The second-sportiest model in the GLA range, behind only the Mercedes-AMG GLA45, my car for the week is the $59,900 (before on-road costs) GLA250 4Matic. 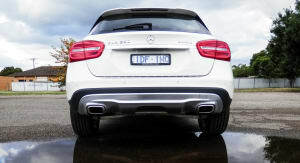 Sitting above the entry-level GLA180 and second-tier GLA200d, the all-wheel-drive 250 gets 155kW of power and 350Nm of torque from its turbocharged 2.0-litre four-cylinder petrol engine, and claims a 7.1 second 0-100km/h sprint and sips 7.0 litres per 100km on the combined cycle. 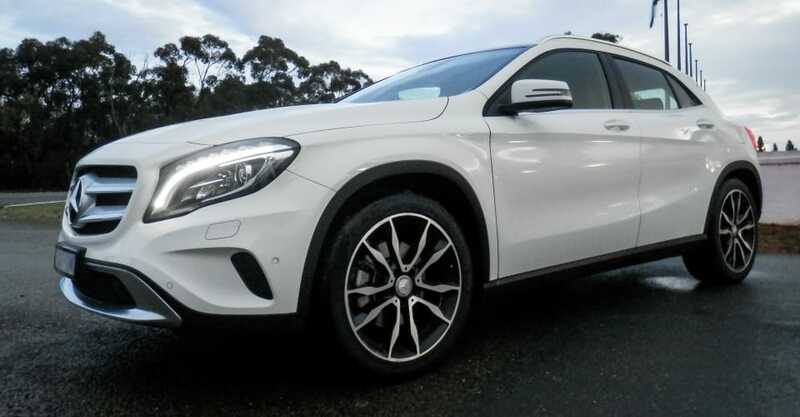 With compact SUVs being the hottest cars to have at the moment, the GLA is one I really like, combining the good looks of a hatchback with the go-anywhere vibe of a high-riding SUV. Loading gear into the roomy 421-litre boot is easy thanks to the power tailgate’s key-fob release, with additional smarts coming from the adjustable tailgate opening height– an ideal feature for those with a low-roof carport. Even though the car is almost 1.5m tall on the outside, there isn’t a lot of headroom inside. Luckily I’m not any taller than six-foot, otherwise we could’ve had an issue. On the positive side, the GLA you see here (a mid-2015 build) is equipped with a ‘Seat Comfort Package’, which, to put it simply, my bum loves. 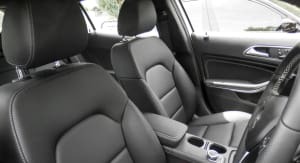 The Artico leather-upholstered memory seats feel like a sponge and are so comfortable, I contemplate ripping them out to somehow construct a lounge suite out of them. They are also heated – and heat up quickly – and have their electric controls mounted to the door panel. 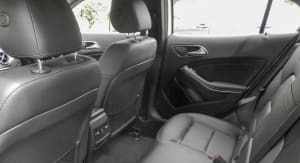 There’s ample room in the back, along with rear air vents, but the middle-seat backrest ain’t that comfortable. Being a pre-update car, our GLA’s standard infotainment screen is the smaller 5.8-inch unit, rather than the larger 8.0-inch. 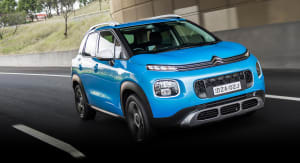 Propped up atop the middle of the dashboard, not neatly moulded into it, the screen sits high enough to make glances at the satellite navigation or rear-view camera easily. It’s all simply operated through a rotary wheel located on the transmission tunnel (near the driver’s left leg) too. 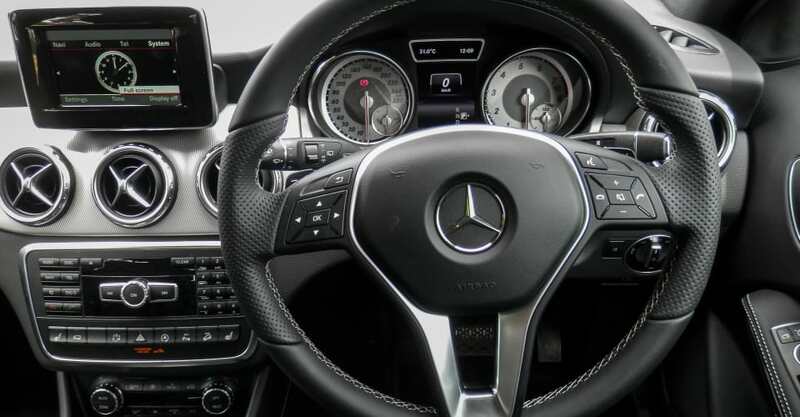 After pressing the GLA’s large brushed aluminium ‘Engine Start’ button, I look down to put the car into reverse, before taking a minute to locate the Mercedes’ contentious column shifter – as I said, this is my first time behind the wheel of a Mercedes-Benz. 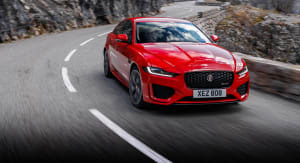 The somewhat dated-feeling shifter controls a seven-speed dual-clutch automatic transmission that delivers shifts that are so smooth you can barely feel them. With a traditional ‘gear stick’ traded for a steering column-mounted stalk, there’s more room up front for storage. This means that the GLA has two cup holders, two clever press-to-open compartments and a centre armrest – beneath which sits two USB inputs. 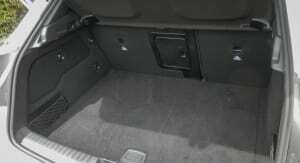 One night – after dropping my phone on the floor – I even discovered bonus storage tucked under the front seats. Often polarising, I’ve really grown to love engine stop-start technology. And within a flash of stopping at traffic lights, the Mercedes switches itself off to save fuel. 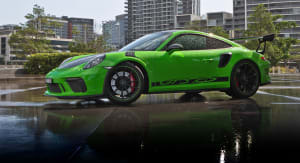 It also automatically stops once you place it into ‘Park’ – annoyingly though, it starts up again the second you take your foot off the brake. The GLA’s rain-sensing wipers get a workout on the soggy drive home to Shepparton, with the inclement weather making me additionally thankful for the car’s standard dual-zone climate control, bi-xenon headlights, and blind-spot monitoring system. 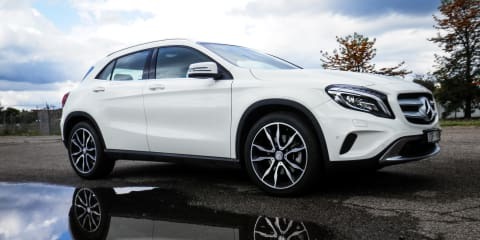 The 4Matic all-wheel-drive system handles the wet roads with ease and – despite the heavy rain – over-shoulder vision in the GLA is clear, along with good visibility via the rear-view mirror. Although I’m a fan of the GLA’s muscular bonnet design, the throttle response attached to the 2.0-litre turbo can initially be quite slow. 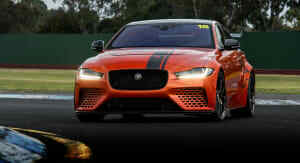 Once all the components acknowledge my request for more oomph, however, the power kicks in, and I feel my back sink into the seat. 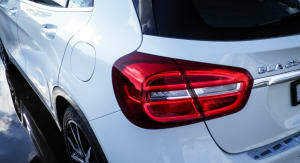 I usually travel around 500km a week, and with the GLA250 claiming fuel consumption 7.0 litres per 100km on the combined cycle, I don’t need to worry about filling up its 56-litre tank. 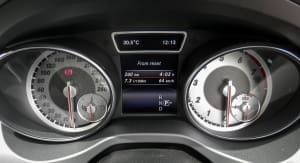 The GLA250 can’t quite match the 5.7L/100km claim of the turbocharged 1.6-litre entry-level GLA180 (a front-wheel-drive-only petrol model) or the impressive 4.6L/100km claim of the diesel-powered GLA200d, but it’s sharper than the flagship GLA45’s 7.5L/100km. 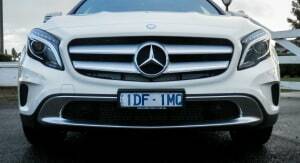 More often than not, Mercedes-Benz models ooze class and quality. 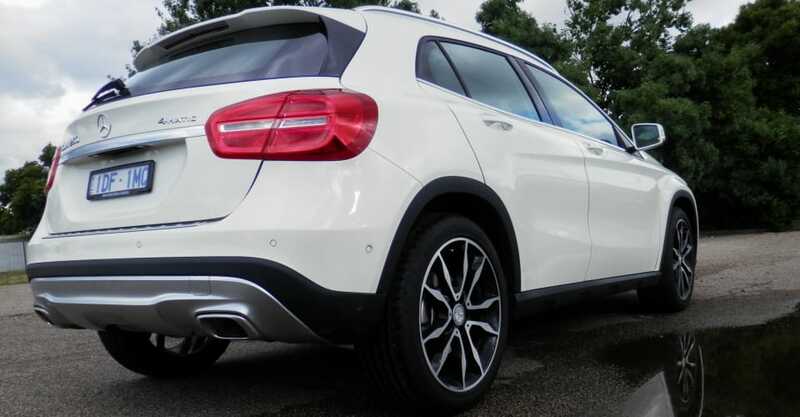 The marque’s first-ever small SUV, the GLA, is no exception. 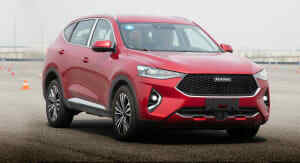 If you’re in the market for a small, premium SUV, you could absolutely look at an Audi Q3 or BMW X1, but with a range starting at $42,900 (before on-road costs) for the base GLA180, even I can afford to put myself behind a car wearing the three-pointed star – and I reckon that’s pretty darn cool. Click on the Photos tab for more 2016 Mercedes-Benz GLA250 4Matic images by Mandy Turner.